ON DEMAND, We, Stabnet Commercials Pvt. 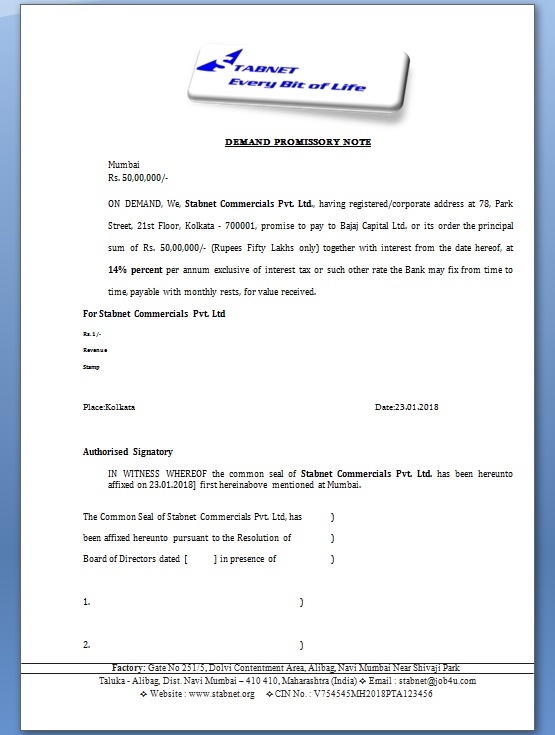 Ltd., having registered/corporate address at 78, Park Street, 21st Floor, Kolkata - 700001, promise to pay to Bajaj Capital Ltd. or its order the principal sum of Rs. 50,00,000/- (Rupees Fifty Lakhs only) together with interest from the date hereof, at 14% percent per annum exclusive of interest tax or such other rate the Bank may fix from time to time, payable with monthly rests, for value received. IN WITNESS WHEREOF the common seal of Stabnet Commercials Pvt. Ltd. has been hereunto affixed on 23.01.2018] first hereinabove mentioned at Mumbai.